Wednesday March 20th. Thursday March 21st. Friday March 29th. Thursday April 11th. Friday April 12th. Thursday April 18th. 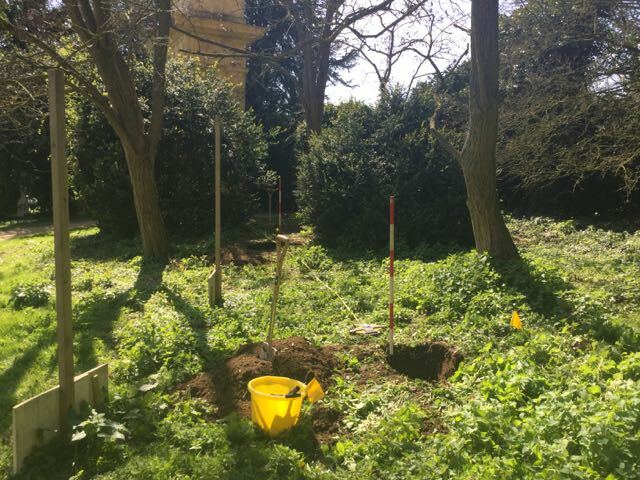 After a preliminary visit and the production of a set of WSIs (written schemes of [archaeological] investigation ) work began on the first of four features within the gardens to be examined. 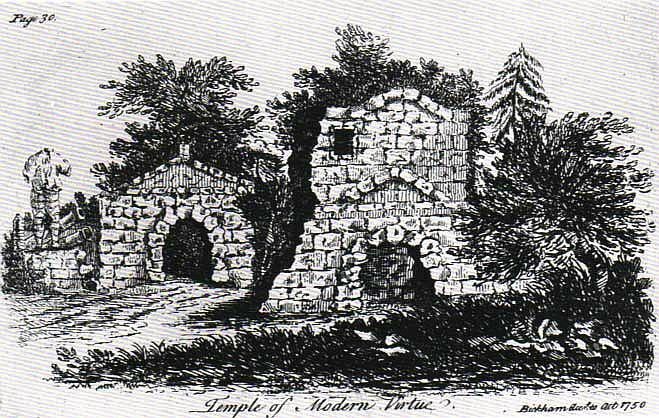 This was the site of the former (ruined and now even more ruined) Temple of Modern Virtue. 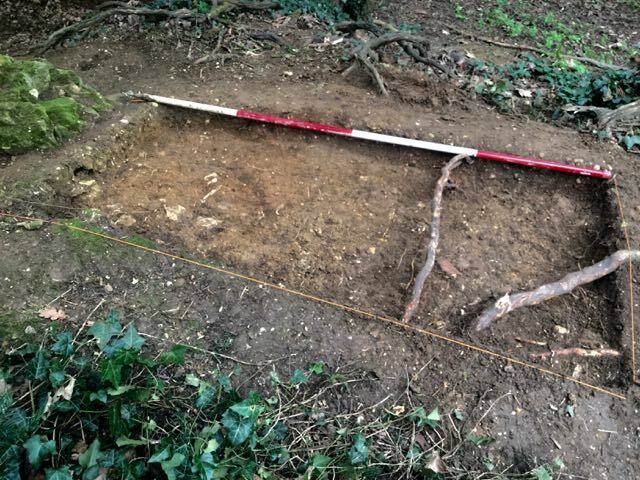 Investigations began with the re-excavation of the 2004 'Trench 4' first dug in 2003 by Northamptonshire Archaeology. 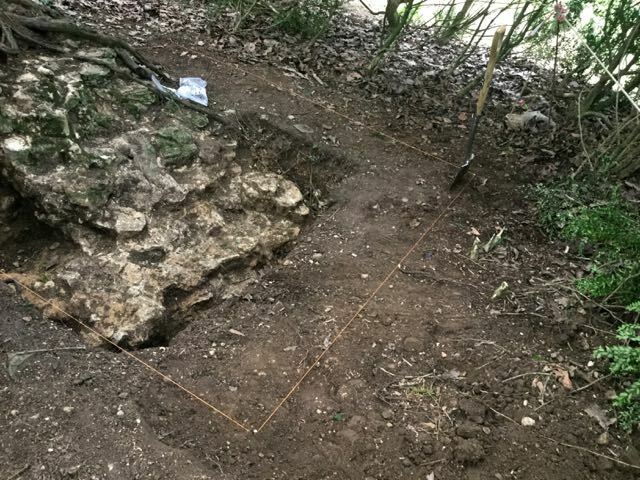 This was selected because it appeared to contain a corner and corners are always good places to begin when trying for a ground plan of an all but vanished structure. Unfortunately I hadn't checked the original drawings terribly thoroughly so it wasn't until half way through the afternoon that I paused only to discover that clearing out the back fill had taken me down nearly a metre in places. 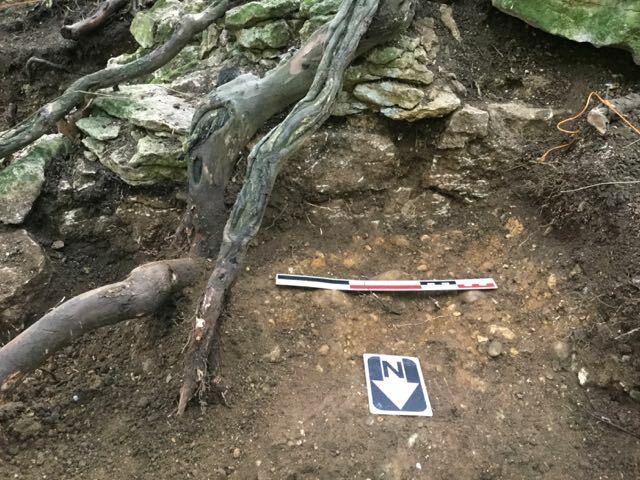 The main feature of interest in the newly re-excavated and slightly extended trench was that the walling seemed to extend further north and east than indicated in the report on the earlier dig. 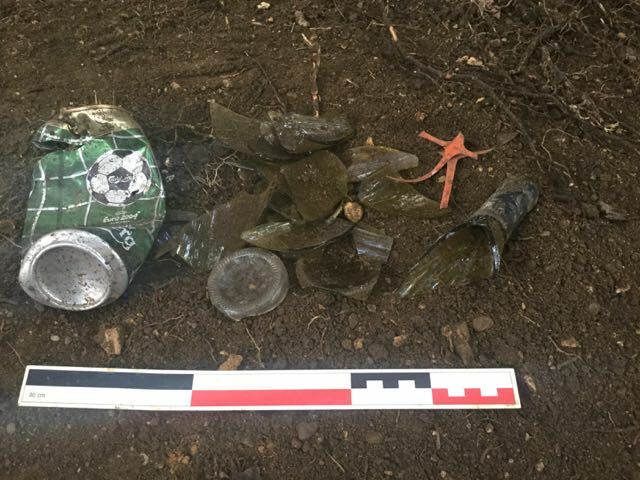 Also of interest was the debris presumably left behind by archaeologists when the trench was filled in. 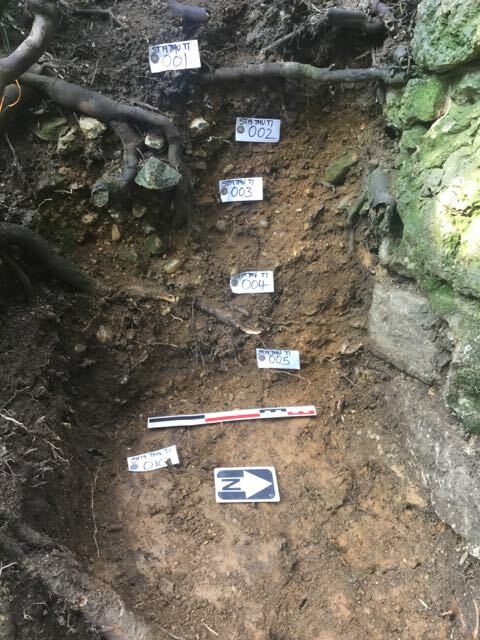 One of the main things to consider is in what direction if any to further extension the trench should go to ensure we understand the full extent of the walling at this point. 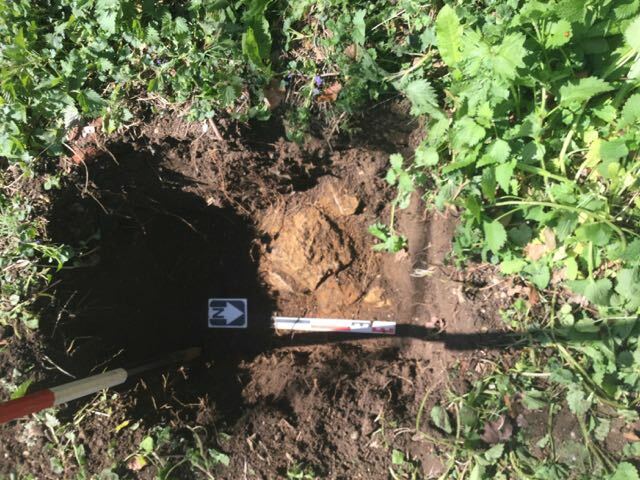 My plan is to consider this once all of the old trenches have been cleared then we can judge what additional excavations are likely to be most productive. 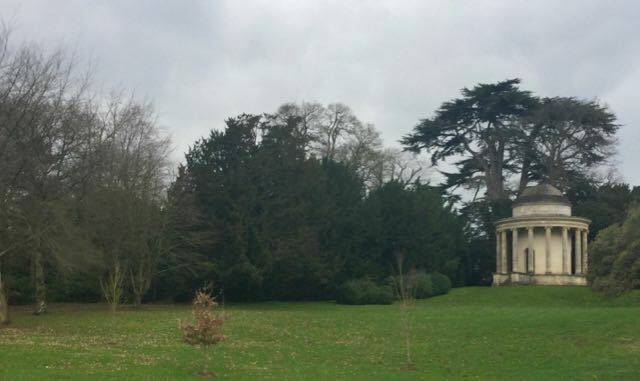 A view from the east, the immensely superior Temple of Ancient Virtue to the right looking down on the suitably hidden remains of the Temple of (non-existent) Modern Virtue hidden behind the foliage in the centre. 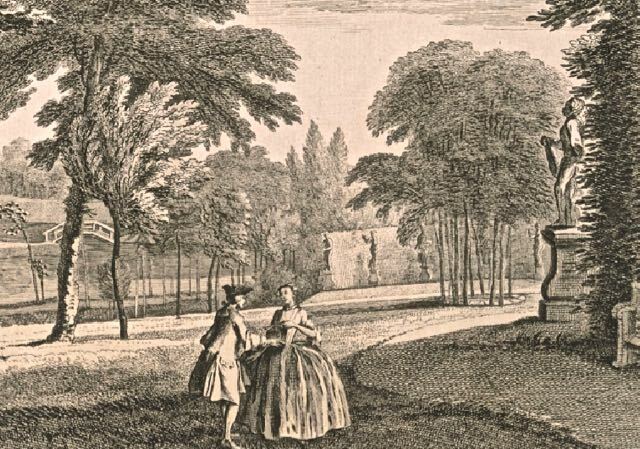 As it was 'a ruin of a ruin' in 1750 from the guidebook at the time. 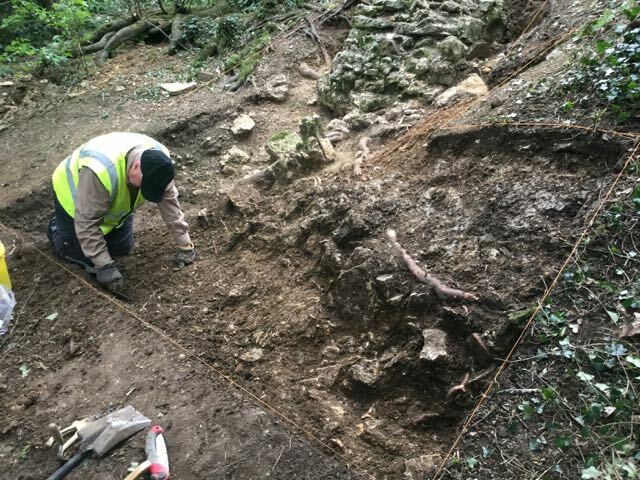 And here's a small surviving section considerably enlarged by a day of digging, both views looking north west. 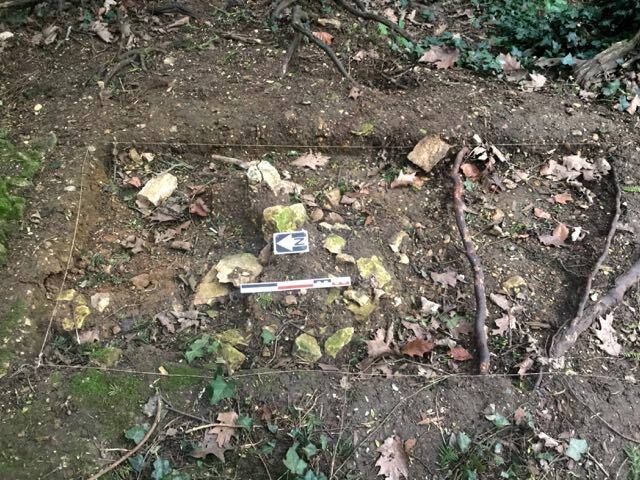 Here is a dig photo from the original trench, we have extended a little to right, plus archaeological evidence for archaeological behaviours, early 21st. century, actually can is in celebration of the 2004 world cup! 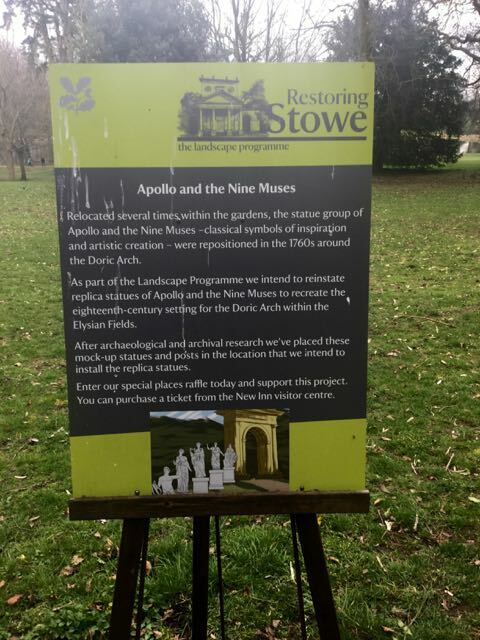 The second site, a short distance to the south was the Doric Arch with its now vanished but temporarily replaced in plywood, statues of Apollo and the nine muses. The notice below says it all. Work is not scheduled to start here just yet but I wanted to take a look at the possible layouts on the ground. 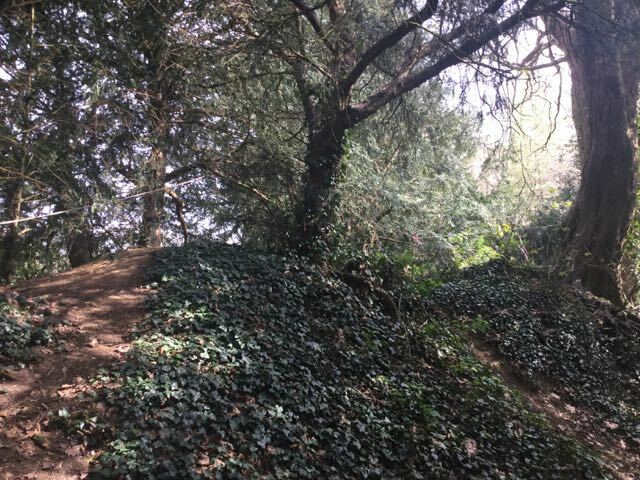 One clue which may prove useful are a number of yew trees.Comparing them with the yew plantings at Farnborough suggests they too belong to the mid-eighteenth century and they may be the remains of a yew hedge set up as a backing for the display of the statues. If this were the case it could help us determine the exact degree of curve of the arc on which they were aligned. 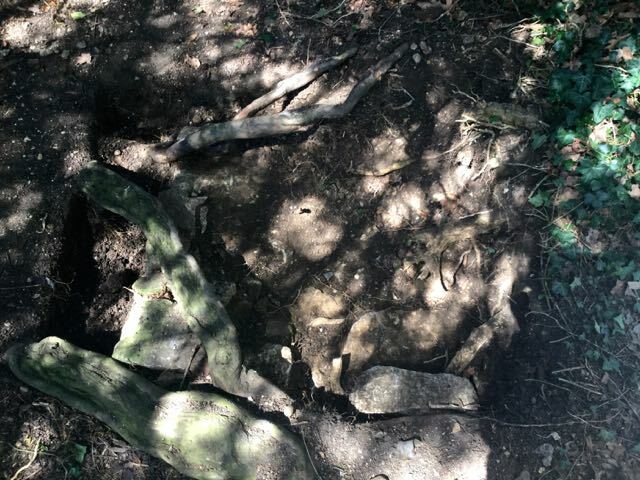 There are also traces of some ancient looking box, could there have been a low box hedge in front of the statues originally? At this stage the whole thing is very puzzling. Changing arrangements? 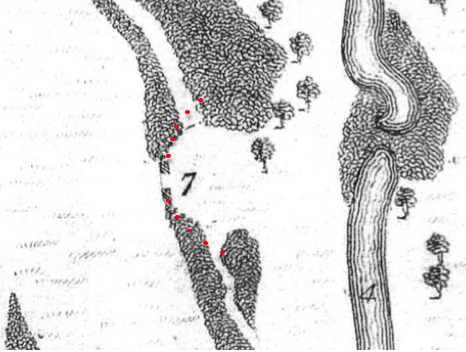 Seeley 1777 and 1820 (plus in red the predicted position of the statues based on the discovery of four bases so far. The area to the south of the arch, the plywood stand-ins have been battered by recent storms. The remaining exposed statue base looking north towards the arch. 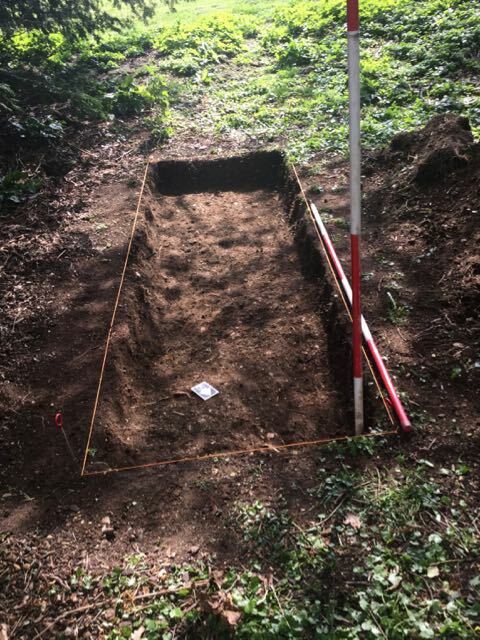 Having pretty well sorted out trench 4, trench 3 was next in line. 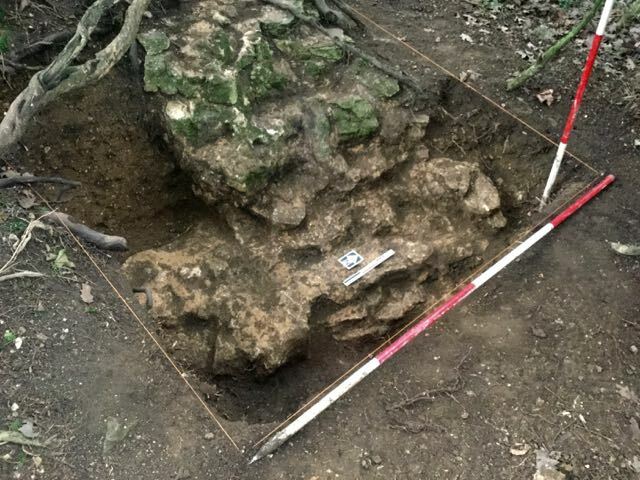 Standing a short distance to the south west but at the top of a slope, was an isolated mass of stone, again previously excavated by Northamptonshire Archaeology and now re-excavated. Close at hand was a trench from last year along the top of the ridge. 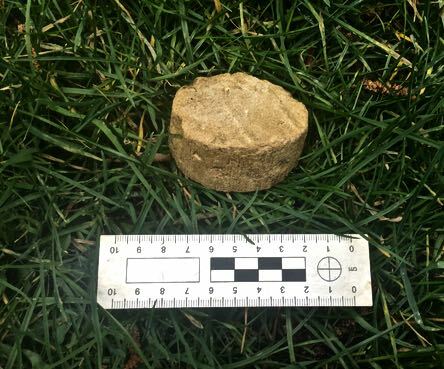 This was cleaned up and the remaining fragments of rubble and topsoil were removed after recording. 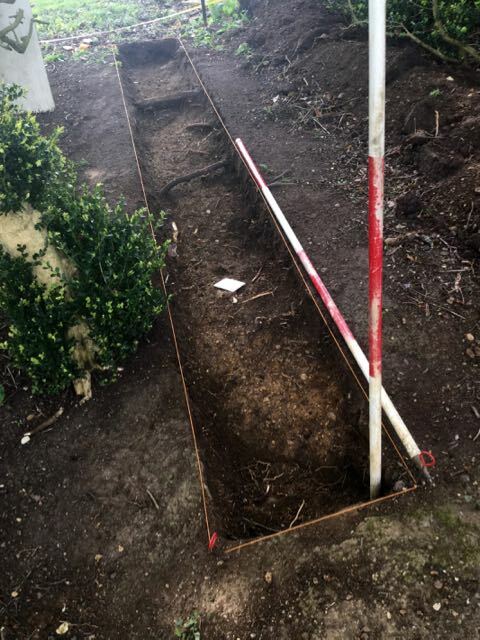 There was a fair depth of back fill to dig out but the whole thing was complete by lunch time. There will be some new construction details to note but the feature does seem to stand alone. 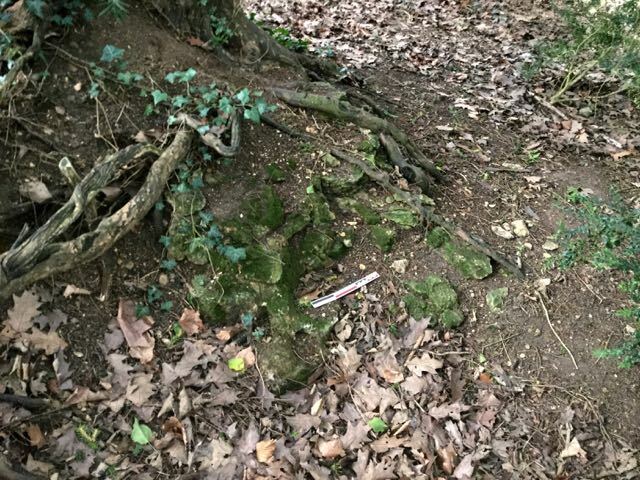 After lunch trench 1 was turned to, can't remember seeing trench 2. 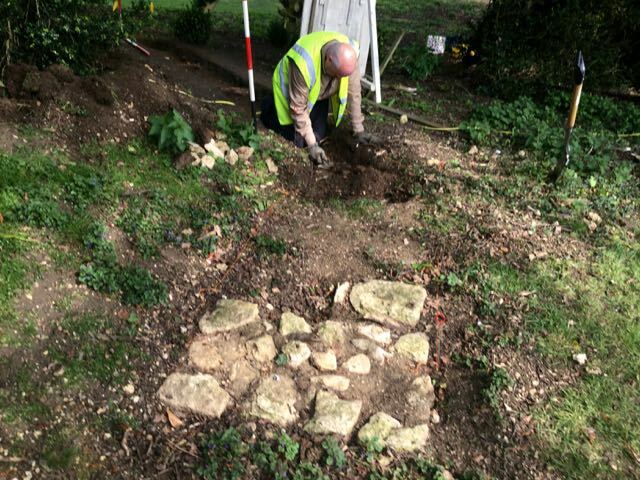 Trench 1 lay around 8m further south and was a similarly centred on a lonely block of rough masonry. As before a more recent trench almost abutted it to the east and the whole area was marked out so it could be treated as a single excavation. 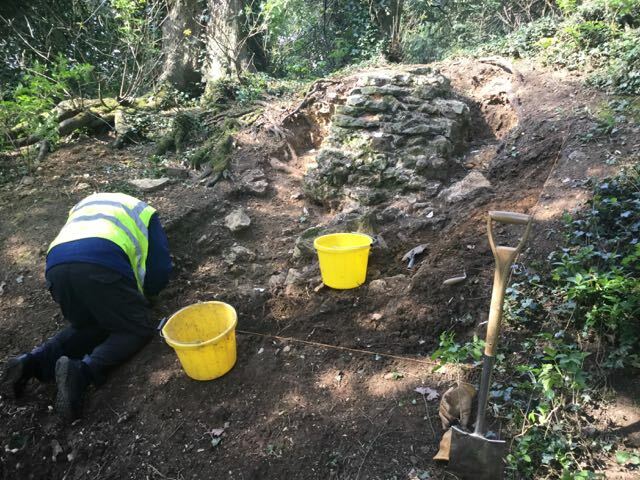 After a lot of shifting of ivy and scraping of moss work started on the south side of the walling and proceeded eastward to link the two trenches together. 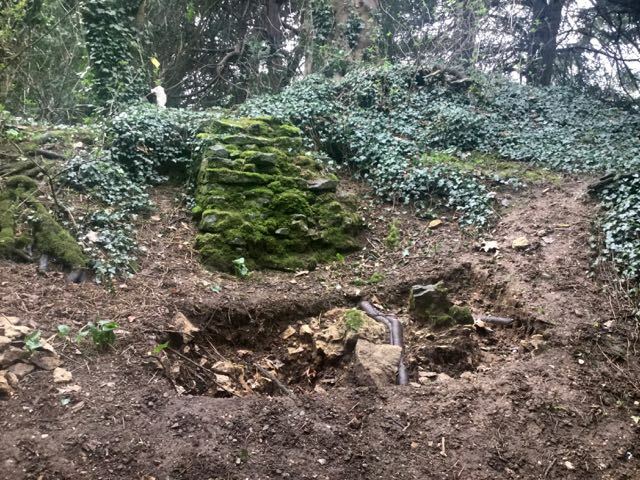 Perhaps the most striking feature was the strange tumbled line of rubble in the eastern trench which not only extended up to the foot of the masonry but seemed to continue below it. This is very interesting and I have begun to wonder whether or not we may have two periods of construction. Both the isolated masses of stone are built of a very hard purplish grey stone in a very hard mortar. 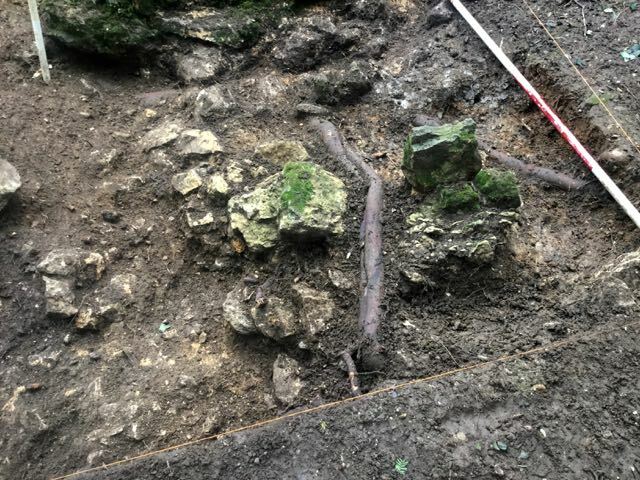 The foundations in trench 4 and the rubble deposit in trench 1 are a lighter softer limestone with a softer sandier mortar in use, lots to think about here. As seen previously the before and after shots, this time of trench 3, first looking north east then looking south east. Yes, same idea again before and after, this time the top trench next to trench 3. 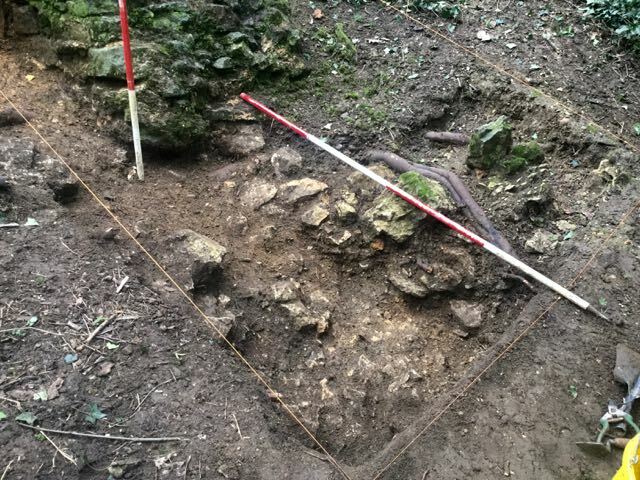 And finally, we arrive at trench 1, definitely the before, the after still to come. ... and here it is from the end of the day with the full extent of the rubble strip becoming clearer. "Weren't there supposed to be some ruins over there? Yea, not sure what happened to them though. Well we need something, can you scrape a bit a rubble together and rebuild it... a bit? 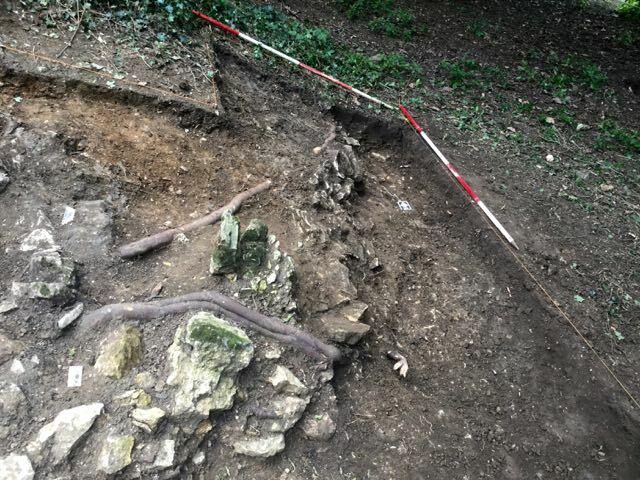 How's that for going out on an archaeological limb? 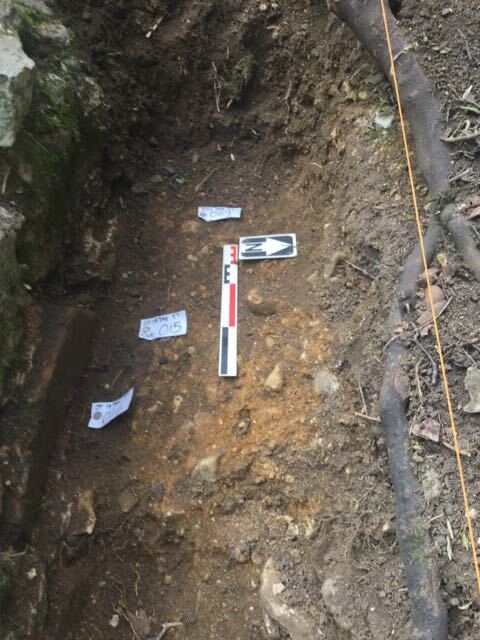 Anyway there's a lot going on in this trench which will need further careful excavation, not to say extension, to help us figure out what's going on. 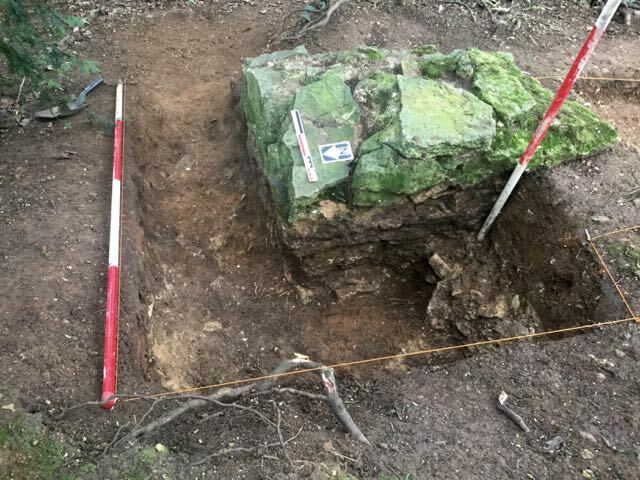 One interesting observation is that theres a bit of coping stone built into the block of stonework, a feature it a shares with the similar block in trench 3. The state of play lunchtime on day 3. 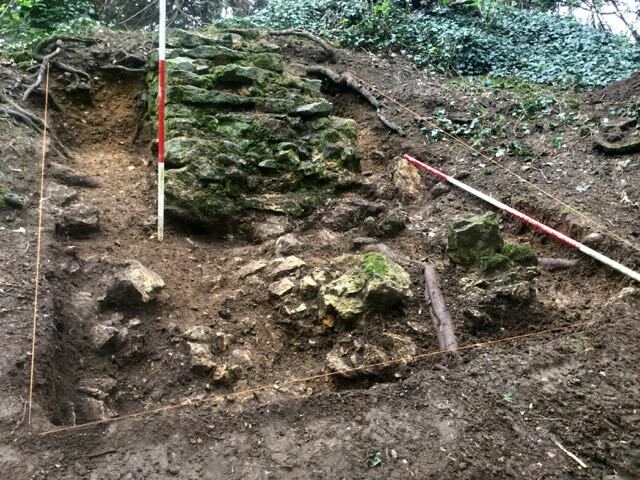 Is the mass of rubble in the foreground the remains of an earlier wall that doesn't quite line up with the later work? 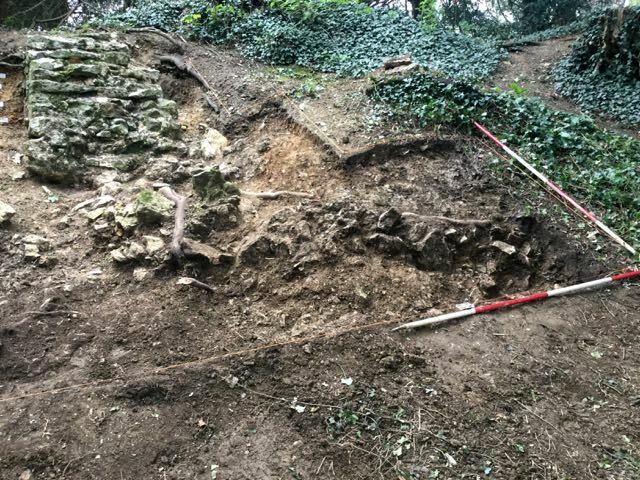 Plus a detail of the rubble showing the curious deposit of grey clay that appears spreading into the north side of the trench. 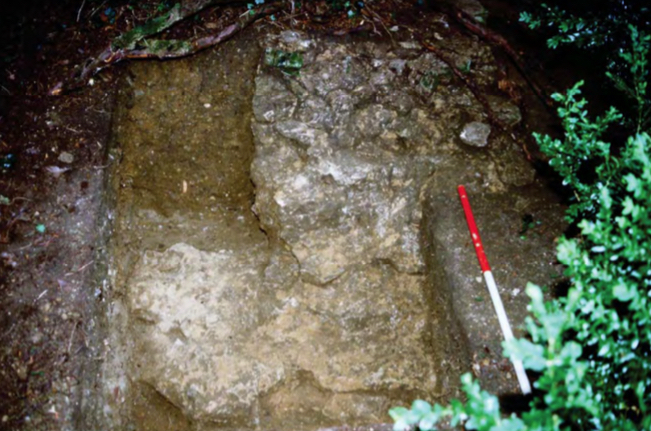 The shaped coping stones in trench 1 and trench 3. Just a morning session primarily taken up in discussions about excavation strategies with the Trust's archaeology adviser, however, there was time to do a little more cleaning and then identify and record the contexts first identified in 2003 by Northamptonshire. It has to be said that what we are seeing on the ground today doesn't quite match what was described back then... hmmm, tricky. 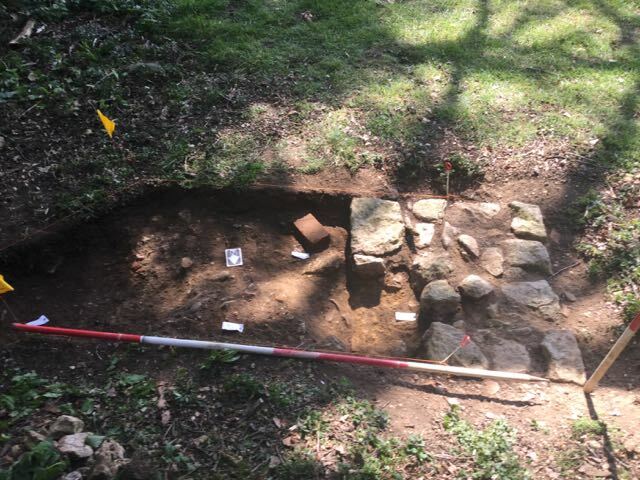 Sections cleaned and labeled in trench 1 to the south and north. A serious day's work in and around the Doric Arch even if we were delayed by footballing on the lawn below. 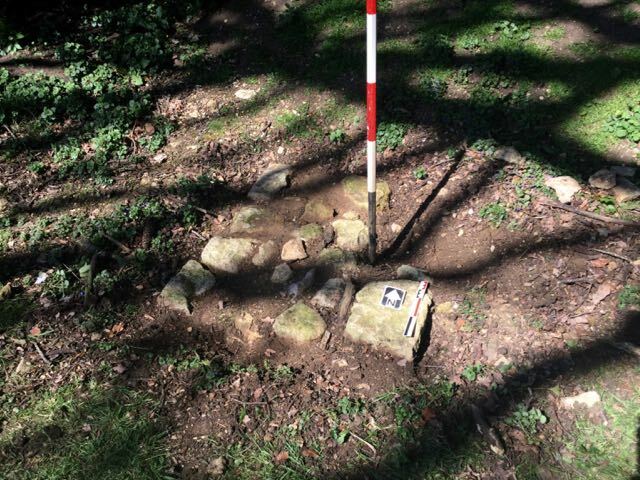 First up we relocated and cleaned the previously identified statue bases and cross referenced them to the 2003 Northamptonshire Archaeology report, some discrepancies in numbering to sort out here. 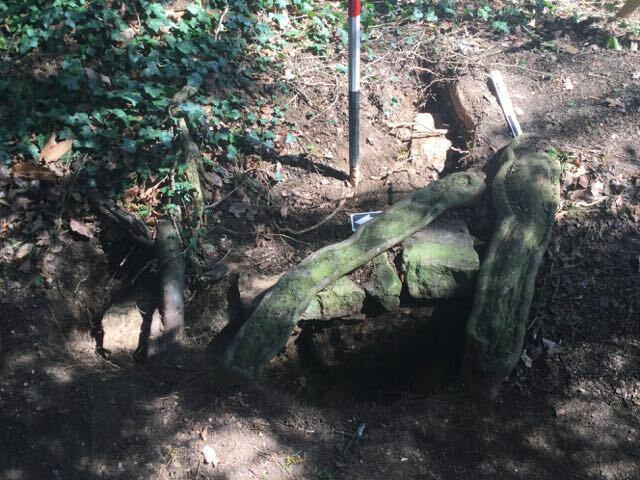 Once we had exposed the centre points of each base we checked the measurements against the published plans and flagged up the location of the northern most pair before back-filling. 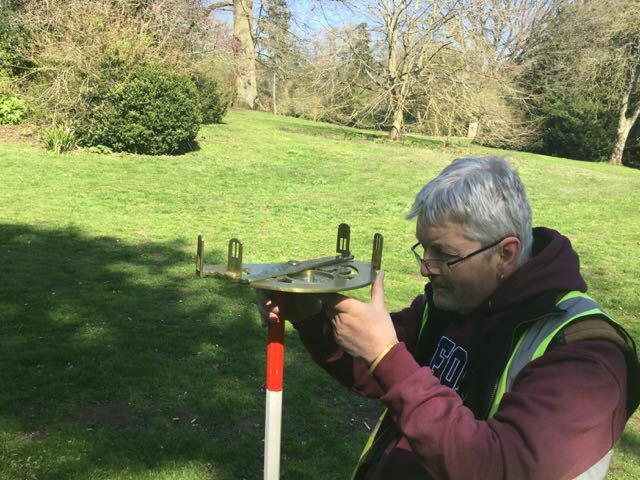 We then took the opportunity to measure out the predicted location of further bases based on the 'arc of a circle' model for the layout before further exploring the geometries of arcs of an ellipse which would in some ways fit better with some of the early engravings and maps. 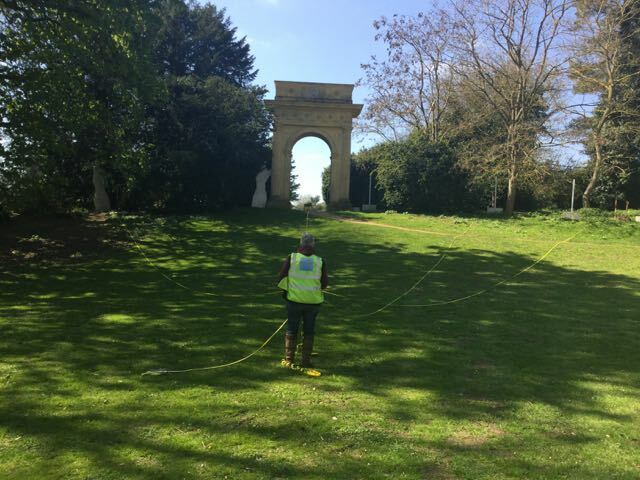 As part of this we also took a turn at measuring some angles between the established statue bases and the centre of the arc using an authentic eighteenth-century angle measurer. Not terribly accurate as we don't have a tripod for it but good fun. 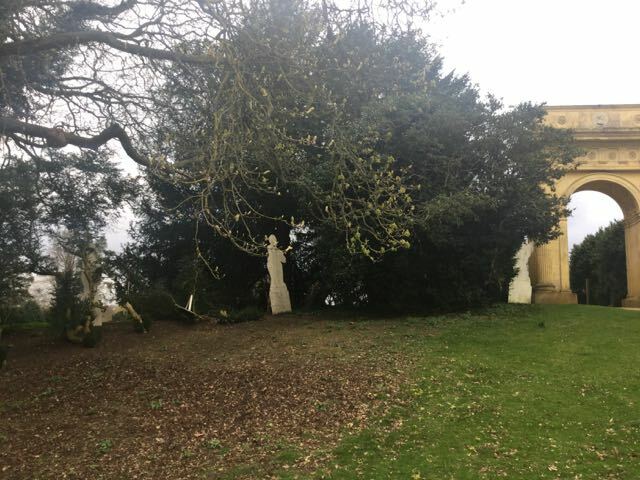 Finally we sought out and annotated on the tree plan all the existing historic yews on the basis that they may represent surviving elements of the yew hedge thought to back the statues of the muses. A selection of statue bases at the bottom of quite deep holes north of the Doric Arch... numbering to be confirmed. 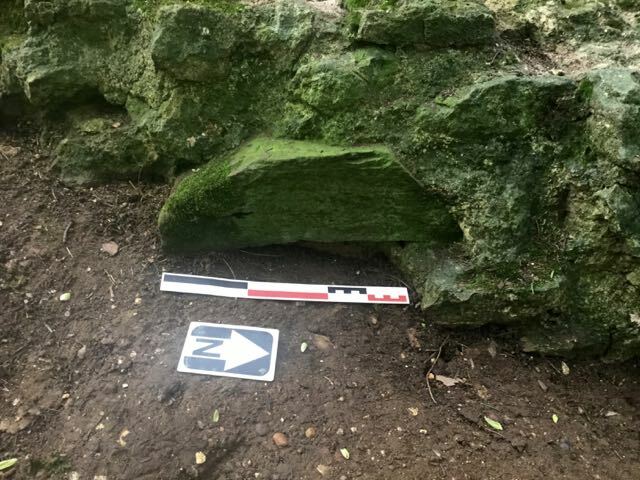 More statue bases south of the Doric Arch, this time pretty well on the surface. My colleague Michael A takes the tapes in hand as we measure radii and then we move on to measuring angles, eighteenth-century style. Back to the temple of Modern Virtue... having cleared it with Barry, the head gardener, we pruned some low hanging deadish looking yew branches and cut down a couple of small box bushes to clear the ground for extensions to trenches 1 and 4. 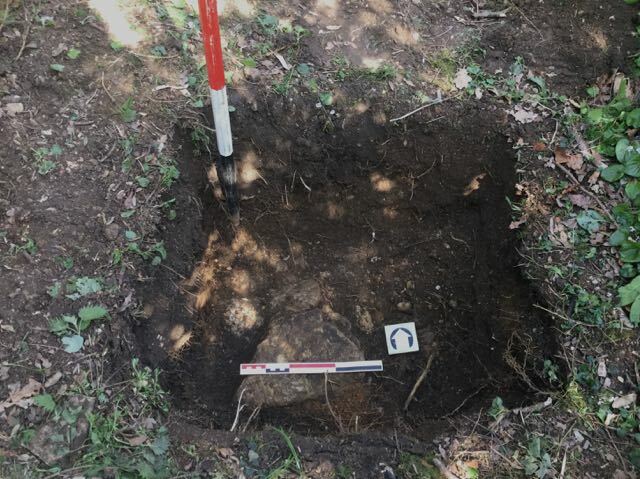 Trench 1 saw the bulk of our efforts as it rapidly became clear, as we removed the topsoil only, that there was a substantial bank of rubble running in a northerly direction backed upslope by a hefty deposit of grey clay and fronted by a spread of loose rubble and mortar downslope. Quite excited by this and getting on well we then engineered a further extension to the north of an additional metre. No longer quite so excited we then puzzled over the precise nature of this feature. 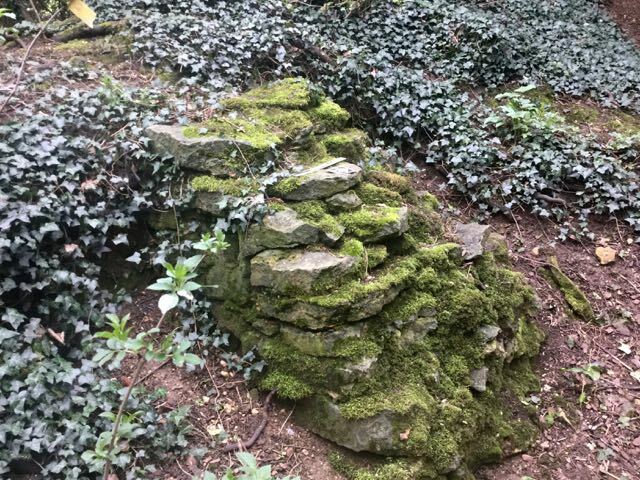 The best case analysis is that this rubble represents the original core of to the temple wall minus it's facing stones, however, close examination reveals that there is no trace of even rudimentary coursing to this rubble and I'm beginning to wonder if it was simply placed to act as a revetment for the build up of the high bank to the west presumably derived from the cutting further to the west, clearly more to do here before we can be sure. 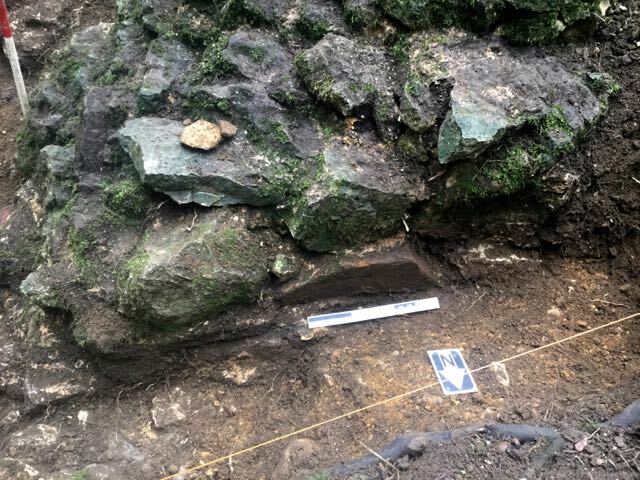 Later in the day a start was also made on the trench 4 extension which gave us our first good view of what a reasonably coursed bit of walling on this corner of the site looking like. Given the fact that it was the school holiday there were a fair number of family groups with children around and a couple of times we were aware of children climbing on the slopes behind us. With this in mind I extended the rope cordon to include the entire site. Trench 1 first one extension then another to explore the rubble bank. 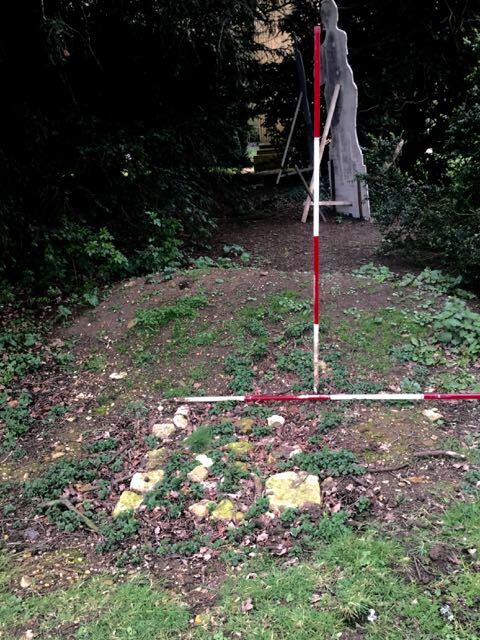 trench 4, the land cleared the extension marked out and a detailed look at the face of the wall to the north. Round about lunchtime the rope barrier is extended to define the boundary of the site a little clearly for inquisitive visitors. The end of the day, most of the topsoil gone showing up the rubble bank looking north and looking west. A change of focus again with the grouping of statues around the Doric Arch becoming the main priority. We worked on a slightly different approach to fixing the locations of the remaining statue bases. This time we measured the angles between the arch and two bases to the north and then used the same angles and the assumption that the bases were at roughly 6m centres to plot the curve. This took the curve to the south of the arch down to a point just in front of the last ancient looking yew which was promising. 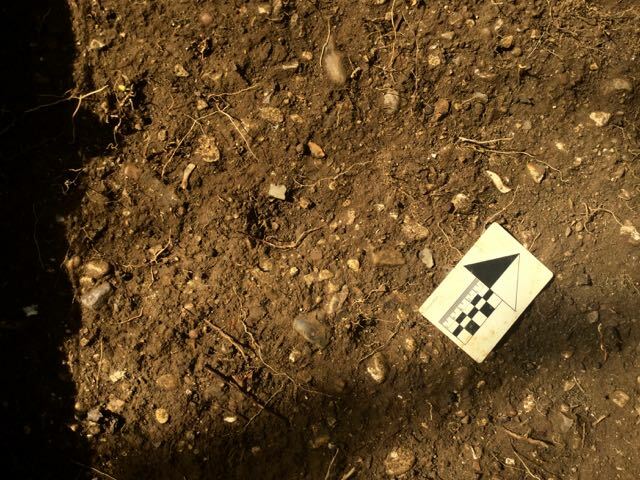 We opened a small test pit up at this point which straight away dropped us onto what looked like a graveled surface. On the assumption that the line of the path would help us fix the curve of the bases we opened an area 3 x 1m but unfortunately this did not reveal either edge of the path... more to do here. Back towards the arch we cut a narrow trench 5 x 0.5m north westwards across the projected line of the path up towards base 4. there was plenty of gravel surfacing which stopped short of the statue base. 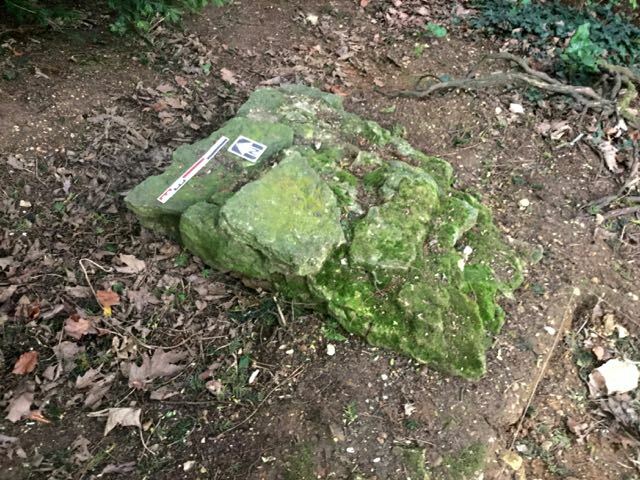 We'll need to do some further cleaning to see just how close the line of the path came towards the statue. 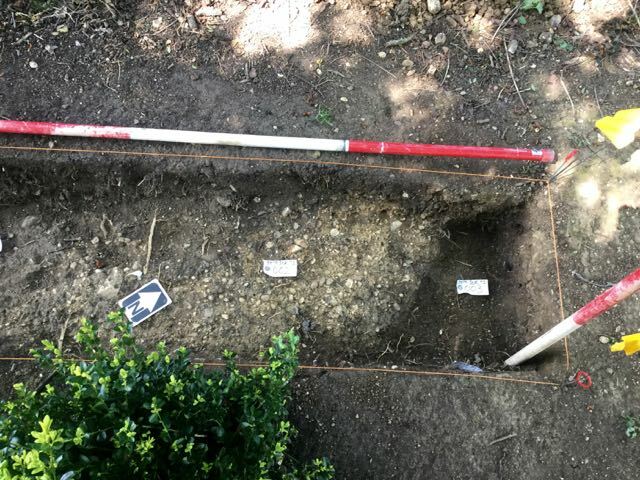 New trench 2 about to turn and examine the relationship between the path and the statue base plus exciting close up of gravel. 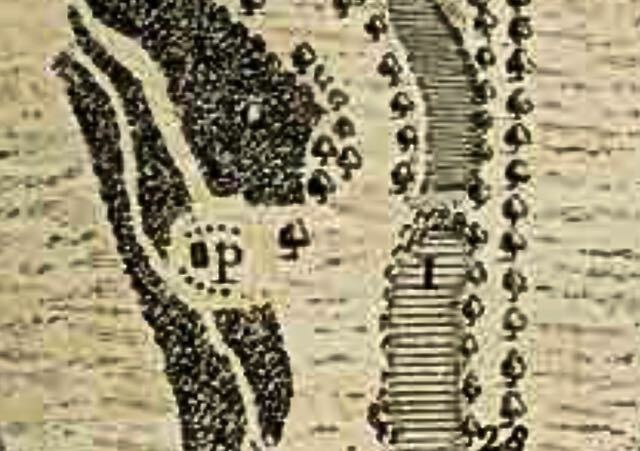 Plan to show the location of the two new trenches. Just a half day today seeing as how it was the start of the Easter weekend. 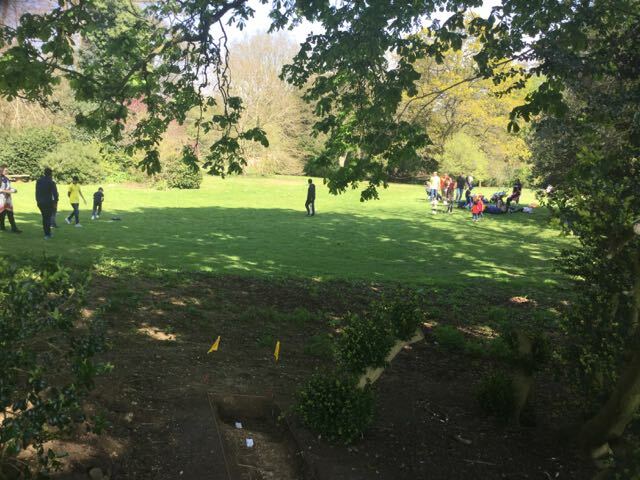 The extension to new trench 2 was completed so that we could take a look at the western edge of the path and the immediate surroundings of the statue base. It looks as if there could have been a shallow gully lining the path at this point, there was also a small mound of mixed composition whcih may be upcast from the shallow pit dug for the bases foundations. We also got a good look at the moratar used here.. The statue base closer to the arch on the south side was also recleaned and further dirt shifted to reveal more of its composition. Interestingly the moratr here seems quite different - white and limey rather than orange and sandy. Finally I popped out onto the golf course carefully timing my expedtitons between rounds and I'm fairly confident that through a combination of observing ground conditionsd and probing I've identified the three additional bases to the south, however, there's not much we can do about them until safe access to the area can be organised. I also came across some interesting indications for the northward extension but without some serious pruning they were quite hard to follow up on too. After lunch the park filled up with visitors and I closed things down when a large group all speaking Spanish made camp and strated playing cricket! Hows that for the full English expereince: cricket on the lawn at Stowe, anyway I didn't fancy feilding at silly mid on and so went home. New trench 2, the approach to the statue base lookingsouth and the shap edge to the path on its eastern side.